"NSW electricity bills will continue to show the cost of Labor’s carbon tax following the release of the Independent Pricing and Regulatory Tribunal’s (IPART) draft pricing determination that estimates the carbon tax and green schemes component will increase to $330 for the typical household bill. Energy Minister Chris Hartcher said that with the Government capping network price rises at CPI or below, the carbon tax and green schemes continue to drive up the price of electricity for NSW households. “IPART estimates that NSW electricity bills would be $171 cheaper from 1 July if Labor scrapped its disastrous carbon tax,” Mr Hartcher said. " What Mr Hartcher conceals is that personal income tax cuts averaging $520 per year were made to cover the cost of the carbon price. The Federal Coalition has promised to remove these income tax cuts. The IPART review of electricity prices shows the carbon price and renewable energy generation has forced down the cost of electricity generation by 2.1 percent. The result is a REDUCTION of 1 percent in NSW electricity bills. Unfortunately, there are increases of 0.4 percent for Network charges and 3.6 percent for Billling and Marketing charges by NSW electricity retailers. These are responsible for the increase in NSW power bills of 3 percent on 1 July 2013. 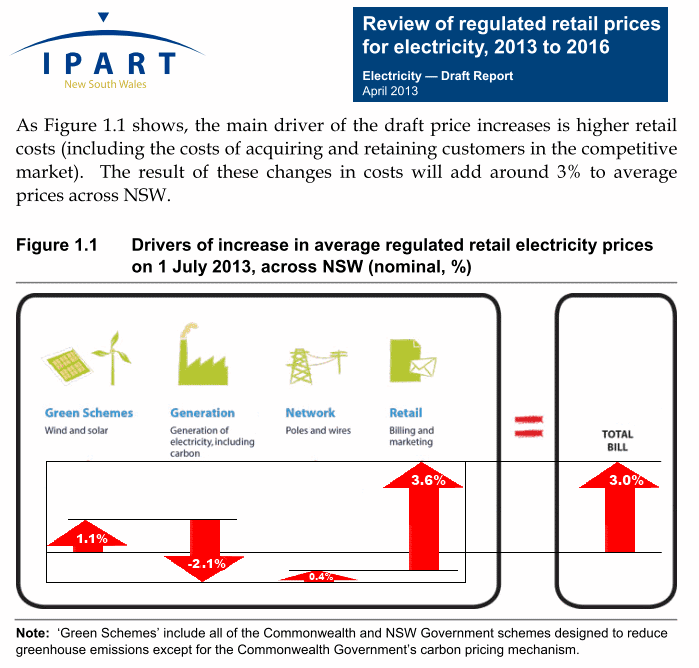 The NSW Government has announced it will place a statement in red on all NSW electricity bills, falsely claiming that "NSW Govt estimates that the Federal carbon tax and green energy schemes add about $330 a year to a typical 6.5MWh household bill – www.ipart.nsw.gov.au"
Struggling NSW families are missing out on $40 million in electricity rebates. 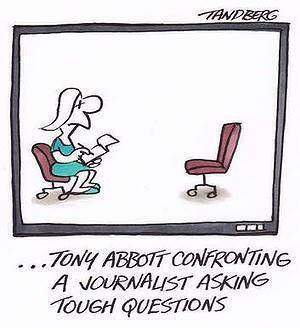 Tony Abbott, the NSW Government and the media spray the public with carbon tax nonsense. The NSW Government is less interested in letting 540,000 families know they are eligible for rebates. Fewer than a couple of thousand have applied for this money to help with rising power bills. Reliance Industries Ltd (RIL) on Tuesday announced it has selected Phillips 66’s E-Gas technology for its planned gasification plants at Jamnagar in Gujarat. ... 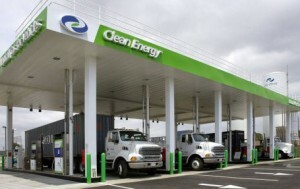 The E-Gas technology has been utilized in commercial applications since 1987. It incorporates a gasification system design that can be applied with gas and steam turbine combined-cycle power generation to produce electric power, as well as synthesis gas applications for the production of hydrogen, chemicals or substitute natural gas in highly flexible combinations. Using the technology China, India, Pakistan and other countries have acquired, Australia's energy needs can be met with no coal seam gas and half of its existing coal mine output. The cost-savings for Australian industry are substantial. Australian industry would benefit from increased international competitiveness. Australian Securities and Investment Commission (ASIC) data shows that the carbon tax has saved Aussie jobs: an average of 20 less companies collapsed each month after the carbon tax began than in the corresponding period a year earlier. For the year to 1 March 2013, ASIC has registered a record 10,632 company collapses, almost 900 a month. “Every time a company collapses, Australian jobs are lost,” said Sophie Mirabella, Shadow Minister for Industry, today. What the data actually shows is that after the carbon price began, ASIC registered only 7,013 company collapses in the 8 months to 1 March 2013. A year earlier, ASIC registered 7,191 company collapses in the 8 months to 1 March 2012. The carbon tax has funded personal income tax cuts and clean technology grants to assist business improve efficiency and cut energy bills. This combination - higher disposable incomes for shoppers and lower business costs - has SAVED Aussie jobs AND saved Aussie businesses. ... while China races to an unbeatable low-cost energy lead. Governments of New South Wales and Queensland are addicted to royalties from coal mining and coal exports. Both major Australian political parties in the federal government and opposition identify coal seam gas as a significant new revenue base in a Petroleum Resource Rent Tax. 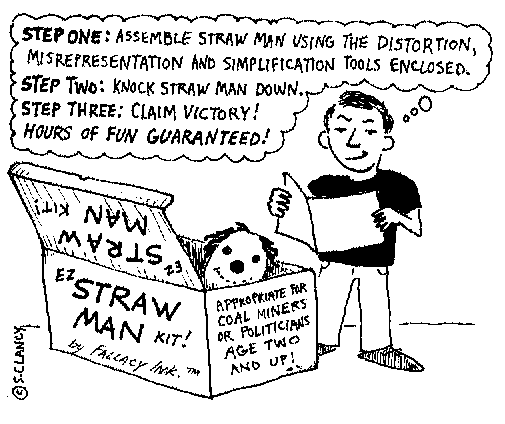 These factors must be behind the incredibly silly debate within Australia that wastes newspaper columns, radio broadcasts and television news reports on lame energy policies of the Greens, Labor and Liberal parties. China of course has no need to entertain such time-wasting and pointless debate. It is getting further and further ahead of Australia with expertise in advanced energy generation technology. This is giving China a world's best practice competitive advantage in cheap energy. Using the technology China has acquired, Australia's energy needs can be met with no coal seam gas and half of its existing coal mine output. 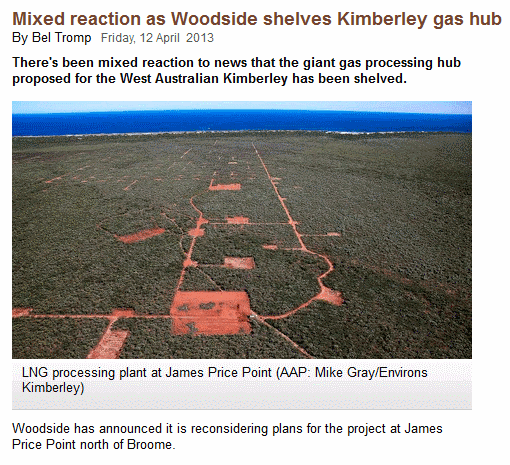 The loss of royalties would create a significant headache for the New South Wales and Queensland state governments. Public debate over renewable energy targets, solar homes and cities, climate science and a carbon price are clever ways to avoid discussion of these facts. The coal royalty revenues of the New South Wales and Queensland State governments remain secure. The Australian Government's prospective revenue from a Petroleum Resource Rent Tax remains safely "in the bag". ---- when proven technology has existed for decades in the USA? Santos Booklet "Moomba Carbon Storage project"
FEDERAL Opposition Leader Tony Abbott has pointed to the Obama administration's inaction on carbon pricing after the US president said more must be done to address climate change. Asked if the president's speech meant Australia should do more to tackle climate change, Mr Abbott said the US Democratic administration had backed away from an emissions trading scheme. "The interesting thing is that President Obama's administration has three times, in the last few months, explicitly ruled out a carbon tax or an emissions trading scheme," he said. "Now, all of us are concerned about climate change. All of us want to do the right thing by our planet. We all want to give the planet the benefit of the doubt. "But we've got to have smart policies, not dumb policies, to do that." The Prime Minister has recently been praising other countries in Asia with regards to climate change. Do you think that you should leave the carbon tax alone? The carbon tax is damaging our economy. It is not doing any good for the environment. No other country is imposing a carbon tax on its economy at that scale. So one of the best things I can do for the families of Australia, one of the best things I can do for the job security of workers, one of the best things I can do to boost our economy and make things like the NDIS more affordable is scrap the carbon tax. When is the Coalition going to release its broadband policy? Having committed Australian industry to a tax of $23 a tonne, rising to $24.15 on July 1, our country will pay while the rest of the world will not, and there is still no sign other countries will join us. The UK Government is acting to give private investors the confidence to invest in the UK’s energy sector. From April 2013 the carbon price floor announced at Budget 2011 will come into effect, providing a clear and credible long-term signal to support investment in low carbon electricity generation. NEW UWA research looking at the economic impacts of implementing soil organic carbon (SOC) sequestration methods into farming practices, is showing that these impacts may prove impractical for farmers. The authors found that while altering certain practices can be used to increase carbon sequestration it is costly and farmers would require high levels of compensation to make it a viable option. By modeling the cost of these practices researchers estimate the profit lost for each additional tonne of CO2 stored on the model farm was $80.00 which is far more than the initial buying price of $23.00 per tonne under carbon tax legislation. Attempts to access this story had been unsuccessful throughout April. Coal built our economy but its future is grim — unless we find an alternative to EPA regulation of heat-trapping gases like CO². If we can clean it up, coal can be a useful resource for years to come. If we can't, it will ultimately become much less valuable. Strange as it may sound, that's why the CEO of one of the world's largest coal companies is in favor of a carbon tax. Marius Kloppers figures that BHP Billiton has hundreds of years of coal in the ground in Australia. The problem is that his biggest customer, China, may tire of breathing dirty air. If they do and if the Chinese innovate around coal, BHP's inventory could be reduced to a 20- or 30-year salable commodity. So BHP wants to push coal up the technology curve. Some U.S. coal companies are also investing in the long-term viability of America's most abundant energy resource. They're rightly asking for and are conducting research on carbon capture and sequestration (CCS). If CCS could be combined with coal gasification technologies, it's possible that water vapor would be the only emission from coal-fired plants. That's a bold future — the kind of future that CEOs like Kloppers want to bring about. The standard play is to try to slow the inevitable. And nowhere is it more standard than in Washington, D.C. The Environmental Protection Agency is under orders from the Supreme Court to regulate CO² as a pollutant under the Clean Air Act. The EPA has drafted CO² regulations for new coal plants. Soon, EPA plans to regulate CO² from existing coal plants. When it does, coal will lose, quickly, to competitors like natural gas. This regulatory scenario gives coal no time to innovate. The standard line from coal state representatives is, "Let's get together and try to stop those regulations." It's the same play textile states attempted when the rest of the country decided it liked cheaper, imported clothes. It's the same play tobacco states tried when the rest of the county decided to quit subsidizing smoking. When something becomes inevitable — like the pricing of carbon — there's little to be gained from simply slowing government regulation. Endless litigation and aggressive congressional oversight may delay the onset of regulations but, like textiles and tobacco, the writing's on the wall. Bluster may provide some cover to elected officials representing coal-dependent constituents, but it won't secure their constituents' future. Coal needs a different series of plays. For coal, the right kind of CO² tax would be far better than pending CO² regulation. A well-planned and fair carbon tax would give coal time — time to try CCS, time for domestic users of coal-fired power to continue manufacturing here rather than moving production to non-CO² regulated countries, and time to continue exporting coal, tax-free. The very different play for coal might look like this: Tax carbon upstream at the mine and at the pipeline. Pair that new carbon tax with a dollar-for-dollar reduction in other taxes so we don't grow the government and families have more money to cope with higher energy prices. Repeal Clean Air Act regulations that would be made redundant by the price on carbon. Make the new carbon tax border-adjustable so that it's removed on exports and imposed on imports. The border-adjustable feature is critical in two ways. First, coal from the U.S. wouldn't be priced out of foreign markets because the U.S. carbon tax would be removed on export. Second, manufacturers who use coal-fired power in the U.S. would have level CO² costs with their foreign competitors. CO² pricing here wouldn't cause them to move their factories to a non-CO²-priced countries because imports would be taxed equally on CO² content. Sometimes we find that something we've been doing for years has consequences we never envisioned. Years ago, who knew smoking caused cancer? Tobacco companies fought the inevitable conclusion of the research, but they ultimately lost. Now, some of the same people — literally some of the same people — are fighting the inevitable conclusion of chemistry and physics and the effects of greenhouse gasses. They will lose. Coal could lose with them. Coal states have the opportunity to call the next series of plays. There's something better than "Up the middle, up the middle, up the middle, punt."